FreeTheMedia Player is the PUP that uses misleading techniques to prevent removal. Use Reimage to locate malicious components and get rid of them faster than with uninstall instructions. A full system scan blocks virus reappearance and prevents traffic to malicious domains. What is known about FreeTheMedia Player virus? How can this virus be avoided? If you are looking for a new media players, make sure you read the other users reviews on the software of your interest first, because you might end up with a FreeTheMedia Player virus on your computer. And this virus is definitely not a program you should keep installed. 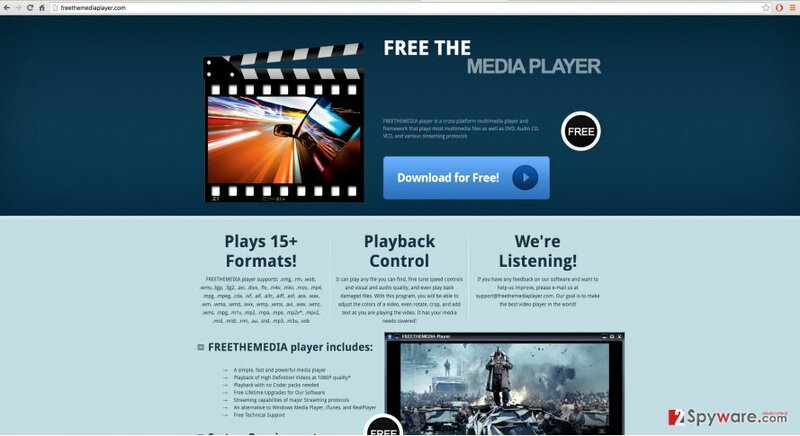 According to the site creators themselves, the FreeTheMedia Player is cross-platform meant to play a variety of multimedia files. Such description posted on legitimate-looking download website can easily trick people into downloading this suspicious program into their computers. However, if you ever stumble upon this application it is highly advisable you avoid it. Keep reading this article to find out the reasons why you should avoid and remove FreeTheMedia Player virus from your computer, if infected. First of all, this virus an adware-type program, so it may interrupt your browsing with a variety of ads and other intrusive notifications. FreeTheMedia Player ads are usually displayed on the so-called virtual layer with a help of which, this application can inject the ads on any of your visited websites. Usually, they will come in forms of pop-up ads, banners, in-text ads and overlay the original content of the web page, so it is impossible to read it. Sadly, this is not the only problem you may have to deal with if your computer becomes a victim of FreeTheMedia Player hijack. You should also keep in mind that the content of these ads rarely corresponds to the user’s visited websites; however, this virus can install other applications to track the user’s behaviour online and generate more targeted ads. This adware may track your IP address, frequently visited websites, viewed pages, and similar non-personal data. However, you can never be sure if the more sensitive data will not be targeted as well. . Also, the users report that these ads generated by FreeTheMedia Player redirect to unreliable and potentially infectious sites. So, to avoid major privacy violations and security breaches, you should get rid of the program before it’s too late. Please use reputable antivirus equipment like Reimage to take care of the FreeTheMedia Player removal immediately. Before heading straight to the removal suggestions, we want to first introduce you to the ways viruses like these spread, to help you avoid similar attacks in the future. First of all, you have to remember that adware and other potentially unwanted programs infiltrate PCs through software bundles. These deceptive packages are often promoted on unreliable download sites while the information about the additional installs is cleverly hidden in the advanced installation settings. You may think that you downloaded a singular PDF creator or download manager, yet in reality, FreeTheMedia Player has been added to your system as well. Luckily, prevention of such shady interventions is not complicated. All you have to do is obtain a reputable antivirus software, use advanced settings when installing new software and carefully choose the sources you are downloading your software from. FreeTheMedia Player removal process may seem intimidating to the less skilled PC users. For such people, we recommend taking advantage of antivirus programs, specifically designed for this purpose. It will take only a few minutes for these programs to scan the system and automatically eliminate FreeTheMedia Player virus from the infected computer. As an alternative option, you can also try uninstalling FreeTheMedia Player manually. However, this method is more suitable for more experienced computer users. If you think your knowledge is more than enough for the manual FreeTheMedia Player removal, you can follow a comprehensive, step-by-step removal guide provided just below this article. Also, in case you are experiencing any difficulties removing this virus from your computer, you can always contact our team of experts for advice. Here, look for FreeTheMedia Player or any other recently installed suspicious programs. Wait until you see Applications folder and look for FreeTheMedia Player or any other suspicious programs on it. Now right click on every of such entries and select Move to Trash. When in the new window, check Delete personal settings and select Reset again to complete FreeTheMedia Player removal. Once these steps are finished, FreeTheMedia Player should be removed from your Microsoft Edge browser. Here, select FreeTheMedia Player and other questionable plugins. Click Remove to delete these entries. Now you will see Reset Firefox to its default state message with Reset Firefox button. Click this button for several times and complete FreeTheMedia Player removal. Here, select FreeTheMedia Player and other malicious plugins and select trash icon to delete these entries. Click Reset to confirm this action and complete FreeTheMedia Player removal. Here, select Extensions and look for FreeTheMedia Player or other suspicious entries. Click on the Uninstall button to get rid each of them. Now you will see a detailed dialog window filled with reset options. All of those options are usually checked, but you can specify which of them you want to reset. Click the Reset button to complete FreeTheMedia Player removal process. This entry was posted on 2016-04-18 at 06:34 and is filed under Adware, Viruses. You can quickly scan the QR code with your mobile device and have FreeTheMedia Player ads manual removal instructions right in your pocket. How did you remove FreeTheMedia Player ads?